I think you all know how I feel about food in jars. On more than one occasion I have debated tossing all of my dishes and just making everyone eat and drink out of mason jars. 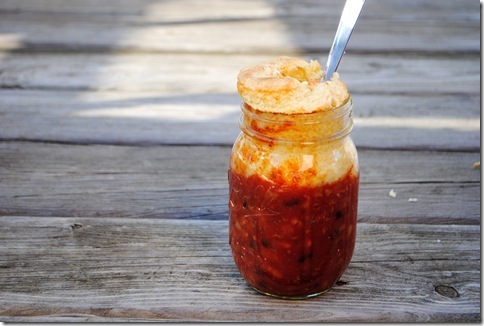 In the summer, barbecue in a jar is the way to go, but now that it is cooling off it is time for chili in a jar. We always have a chili cook off at church for Halloween and I think this would win hands down, just for cuteness! Someone needs to make it, because I will be too busy decorating! Kristin created this jar of chili topped with cornbread and you can get the recipe for this cornbread topped chili over at Iowa Girl Eats. I think I am actually gong to try this!